Adam Weber, (@adam_weber), Co-Founder and VP of Sales at Emplify. Well before he ever carried a quota, Adam carried a Bible as a founding Pastor at Commonway Church. His ability to talk and connect with people carried over into building one of the hottest and fastest growing startups in the Midwest. His strong commitment to getting better every single day should resonate with most of us. Adam grew his business by simply “doing the behavior.” He set a minimum standard for himself of making 50 cold calls every single day. Picking up the phone didn’t come easy, but by committing to it, he saw progress after every dial. Adam constantly asks himself “what are the minimum things I have to do today?” Once the standard was established, the work ethic followed. 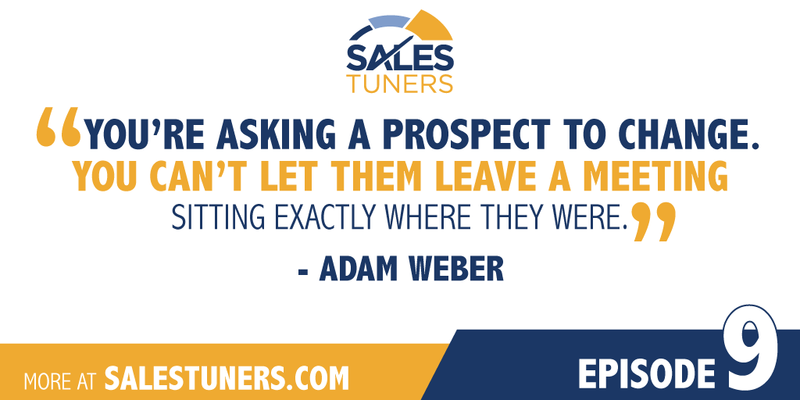 The willingness to do the behavior, to learn the process and ask good questions is what makes Adam an exceptional sales leader. He wakes up wakes up every day with a passion about what he does and his discipline around how he spends his hours is what has made him successful. Get a Prospect Moving: Ask good questions to establish credibility and trust. Your questions should be centered on moving a prospect from a neutral position to one where they’re willing to make a change. Stay the Course: Put in the work every single day. The close may not come right away, but take the time to continually deliver value filled messages and touches to stay top of mind. Maximize Your Time: Instead of making four hours of work look like 10, focus on maximizing your eight hours to hit your goals.